UPDATE 10/24/17: Like George Clooney and so many others, yet another 4H member: Harvey’s Hateful Hollywood Hypocrites. Of course she had no idea. She didn’t know nuthin’. UPDATE 2/13/17: Now on a really Radical Chic roll, our firebrand likens herself to a victim of the Holocaust, vowing not to bend to the “Brownshirt” brutality of a ridiculing Tweet from Donald Trump. In pampered MerylWorld, being accurately called “overrated” on Twitter is very much akin to being stomped on the street by club-wielding terrorists in Hitler’s Germany. Except one need not travel back in history nor even more than a few miles for some real Mussolini Mayhem where her fellow “anti-fascists” in head-to-toe black are breaking faces and windows and shutting down “unacceptable” speakers like McInnes at NYU and Milo at UC-Berkeley. Thus far, no one can point out any parallel instances of “Fascist” Trump supporters terrorizing “anti-Fascist” Hillary voters. Today’s Hollywood “Stars”, those strikingly drab people paid ridiculous sums to play make believe, now make believe they have a corner on reality, human compassion in particular. Overriding any grasp of reality (on which they have a tenuous hold) or genuine compassion (suicidal in their cutthroat business) is the burning need to justify their surreal salaries and inexplicable power to attract attention. Thus, we have that endlessly annoying creature known as the celebrity/activist. You know the type: the fabled “luvvie” all for open borders and gun control with absolutely no intention of giving up personal armed security details or opening up any one of five luxurious homes to unvetted riff-raff. In true Lefty/Lib fashion, the government (or someone else) will take care of it, but it sounds and feels soooo good to “speak out.” Oh, and so courageous too. For some semblance of credibility, these hyper-privileged bores must form a fantasy bond between themselves and the have-nots they claim to champion. They are the charter members of IAVT (I’M A VICTIM TOO!!) wanting us to believe that their pain is ours and ours theirs and…oh, you know! Over-honored and nauseatingly overrated actress Meryl Streep recently accepted some meaningless honor or other which she saw as a chance to establish her Serious Human Being credentials. She began by cataloguing her own humble beginnings (Public school! In poor, rundown Bernardsville NJ!!) and the Dickensian origins of everyone else in the room wearing a $20,000 gown and $15K tux. Following that poignant preface, she launched into a badly acted, unconvincingly tearful attack on Donald Trump, such a novel and brave act these days, describing in graphic fashion the “hooks” he had buried in her tender heart. According to her, Donald had made fun of a disabled reporter with mocking gestures. Except the rather animated Donald is well documented using such gestures routinely in numerous other instances. What the man is guilty of is not letting race, creed, color or handicap stand in the way of calling out a phony and liar, a very unusual approach nowadays…and one that can get 60+ million fed-up Americans to vote for you. Where is the outrage of Meryl and her compassionate claque when their magical Barack makes a joke at the expense of Special Olympics participants? Also conspicuous in its absence is condemnation of one Bill Clinton’s well-documented serial exploitation of anything wearing a skirt. Not to mention a certain spouse of his who made it her business to intimidate and threaten any of those many assaulted women who might ruin his and (more to the point ) HER political career. 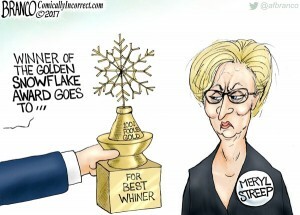 With Meryl and her ilk, we’re far beyond mere hypocrisy on any and every subject of importance, be it immigration, racism, sexual exploitation, whatevah… It’s shameless lying, slavishly enabled by a complicit MSM. And then along comes a crude, direct billionaire businessman bulling his way through this seedy PC china shop afloat in lacey snowflakes like Meryl Streep. In a way, rich celebrated fools like her should be awarded some sort of golden statuette. They and their useless babble have made the Trump Revolution possible. We salute you! Standing O from these quarters for Meryl The Marvel!! This week’s article reminds me of Sidney Hooks description of postwar Communist recruiting. When the Party had trouble controlling its celebrity recruits in New York, they discovered that Hollywood celebs would fall for anything and mouth any words that gave them an aura of thoughtfulness. The lineup of Hollywood limo liberals is, one after another, paradigms of self-absorption, self-regard and self-aggrandization; all in search of some distinction that would seem to warrant the wealth they have accumulated for memorizing and speaking back the words and ideas of others. Going their merry, self-delusional, self-aggrandizing way. And what bores.